Representatives from the U.S. Department of Agriculture Rural Development, the office of Assemblyman Jordan Cunningham, the office of Supervisor John Peschong, City of Paso Robles, Paso Robles Housing Authority, and Paso Robles Chamber of Commerce joined Peoples’ Self-Help Housing for a ribbon cutting celebrating the grand opening of Creston Garden Apartments, upgraded affordable rental housing in Paso Robles, CA. View more images at pshhc.org. 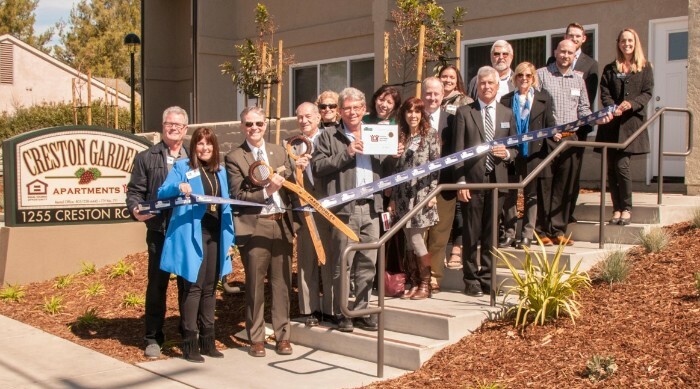 Paso Robles, Calif., March 6, 2018 – Joined by local elected officials, partners and residents, Peoples’ Self-Help Housing (PSHH) held a Grand Opening celebration and ribbon cutting for its latest affordable housing development, Creston Garden Apartments, on February 28 in Paso Robles, CA. In attendance for the celebration was representatives from the U.S. Department of Agriculture Rural Development and the offices of Assemblyman Jordan Cunningham and Supervisor John Peschong plus City of Paso Robles Mayor Steve Martin, Councilmember Fred Strong and representatives from the Paso Robles Housing Authority and Paso Robles Chamber of Commerce. Guests toured the new learning center, playground and sport court plus the expanded community center and upgraded rental units and grounds. Addition of learning center and expansion of community center, which allows for onsite educational programs and social services. Levelled townhome foundations to alleviate sagging. Installed forced air and heating in all units. Units had no AC and limited heating prior to the upgrades. 6 rental apartments were upgraded to be ADA-accessible. New tenant-friendly mailboxes centrally located near the manager’s office and community and learning centers. Solar panels installed on the roofs of the community center and learning center to power each facility and all exterior lighting on the property. New playground features play areas for toddlers (3- to 4-year-old) and 5- to 12-year-olds which include play structures with large shade umbrellas and soft and durable turf with shock-absorbing padding. Funding partners include USDA Rural Development, JP Morgan Chase Bank and Enterprise Community Investment. Development partners include Keith Hall Architect, North Coast Engineering, Ashley & Vance Engineering, Inc. and Robert Andrew Fowler Landscape Architect. Creative partners include Adele Rosen of Interiors by Adele and Dan Harding. For information about rental applications, please visit the Creston Garden Management Office or www.pshhc.org. For more details about PSHH programs and services, please email info@pshhc.org or visit www.pshhc.org.